The SFS family of Tray packing machines can be used to create Shelf Ready Trays with Lids, Shallow Trays, Partially closed Trays or Trays with Slots for Pots. Trays are formed from Flat blanks. 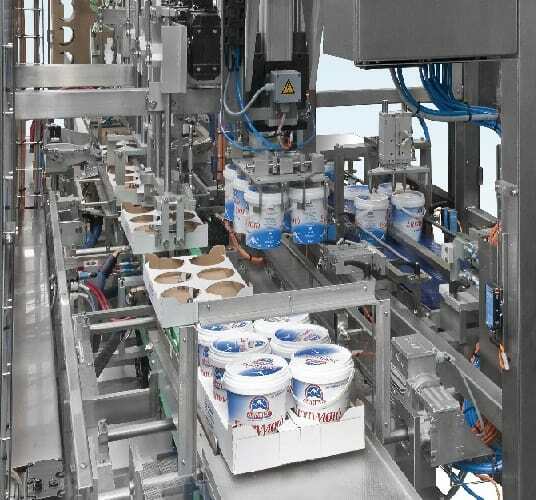 The Products can either be loaded after the tray is fully formed, as in the case of Pots of Yogurt or Desserts, or the Products can be loaded and the tray formed around the product. This is usually the case when for Banana Box type Trays. Trays can be Stacked using our Tray Stackers and then Lidded. These lids can be removed as shelf ready packing.